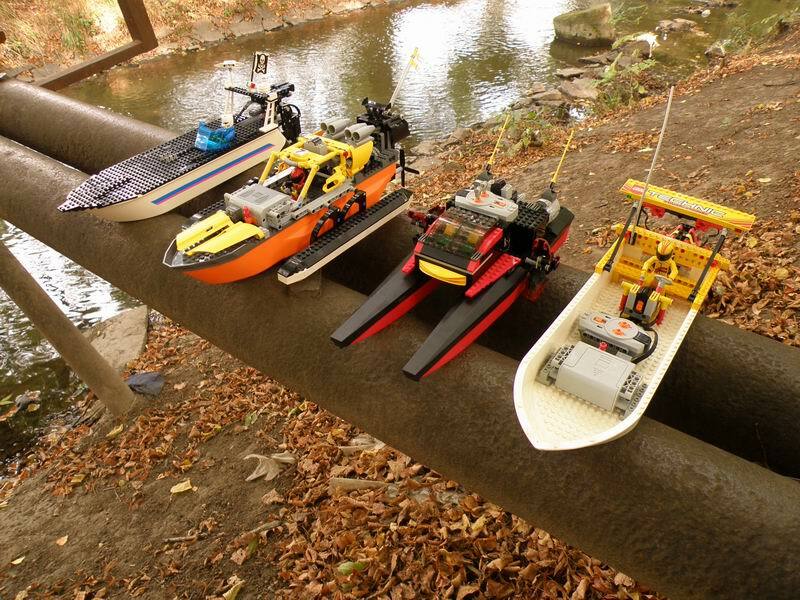 At beginning of October, guys from Kostky joined not for one of their traditional races with LEGO Technic vehicles, but something very new, what they called LEGO Ship Racing (LSR) this time. Definitely these guys are always willing to take new challenges and pushing their innovation spirit forward. Not that I understand even one word of Czech, but if I got it right from their forum, the competition was made of two races. One 'sprint' and one 'slalom' race. From the images below, you could take a better idea about the paths defined for these races. You can find several other photos from the racing event, at this Brickshelf folder. I must confess when Sebastian (Shmade) raised my attention to this and I first read his e-mail, I didn't even noticed it was about ships. Then I saw the BS folder with... boats!? It looks they had a lot of fun, and I wish them to repeat it many times. Wow, that's a pretty cool idea. I wonder if the motors or the remote would get damaged from the water.. if not i just may take a crack at it myself! Maybe the PFGeeks out there could help me, but why are the PFRemotes on board some of the boats? Some have submerged PF motors, which worked for days. Of course one day or another they got broken. To my understanding the boats are "paired" with the respective remotes, while being exhibited over the pipes to the photo. You won't see the remotes anymore, once the boats got into water. I want to make my own PF remote control boat but I'm worried about the electric parts get wet and damaged. I'm the builder of the red katamaran. I indeed have fried the PF reciever due to water splashes from the paddles. All the others had classic propellers and no splashing during movement. As far as I know, I was the only one having damaged a PF element. PF motors are quite safe, generally electric motors can run safely entirely submerged. @Jernej: Yeah, some time ago I thought about that, too, but for a LEGO blimp instead: pairs of similar propellers with symmetrical pitches, to be able to be rotated in opposite directions. That would be handy for boats as well. @Jernej: Actually, the situation is not that bad. To our surprise the 2952 2 blade propeller (you can mount two perpendiculary on one axle) is quite powerful in water. It works really well when powered directly by a buggy motor. The high RPM makes up for little bore it has. @AVCampos: That was the biggest surprise of all, we really didn't expect for all the boats to finish. Rescueres with specialized tools (strainer taped to a broomstick :-) were on alert during races. I love it. These guys are inspiring.